How to tackle impasse at HCMC hi-end delayed properties? Government support is vital in tackling numerous delayed real estate projects in multiple hi-end areas in Ho Chi Minh City. According to Ho Chi Minh City Real Estate Association (HoREA), the city is currently home to 138 delayed realty projects which could not resume construction despite concerted efforts made on behalf of developers, banks and construction authorities. Hi-end office towers and residential buildings held a significant part of these delayed projects. Close to the foot of Khanh Hoi bridge in Ho Chi Minh City’s District 1 is the site of Saigon One tower project, developed by M&C JSC with an estimated investment capital of $200 million. Construction kicked-off in 2007 and the project is set to encompass a six-storey trade and services centre block, a 34-storey top-grade office block, a residential block with 133 hi-end condominiums together with all the modern service facilities. The project, however, has seen construction suspended for approximately three years. In the eastern gateway to the city centre on Dien Bien Phu road in Binh Thanh district is the site of luxury DB Tower project which consists of three underground levels and a 22-storey tower. To the right of DB Tower is the V-Ikon office building which was halted for two years because of a shortage of funding after completing the bare shell construction. This project is designed as an A-Class office building, reaching a height of 125.8 metres (26 floors), as well as four underground levels. 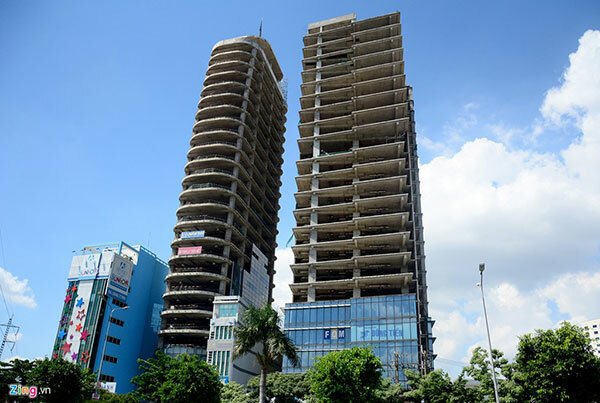 Several such half-completed works are to be seen across the city’s District 7, such as Kenton Residences project which is located near the Nguyen Van Linh-Nguyen Huu Tho intersection. As announced in 2009, Kenton Residences has investment capital of about $300 million, built on 9.1 hectares. The project consists of three zones with nine towers and 1,640 apartments. The construction, however, was suspended from 2012. After sitting idle for over three years, the building now looks like a ruin whereas it was once expected to become a highlight of the city's southern part. It is not only tower projects facing delays, other projects such as building villas or selling land plots share a similar fate. The building of a luxury villa complex of Ha Do Limited in District 2’s Thanh My Loi site or another project involving the construction of tens of villas in District 9 have yet to be completed. According to Ho Chi Minh City Department of Construction director Tran Trong Tuan, there are many causes for the buildings’ half-finished situation, with the investors’ capital shortage being the biggest one. Some investors had halted their projects to wait for positive signs from the estate market. HoREA chairman Le Hoang Chau has attributed the major cause to businesses’ speculative mindset. Interestingly, the above-said projects are mostly in the hi-end segment. When the real estate market was at its peak, even financially incapable developers had rushed into developing hi-end realty projects by resorting to bank loans. This explained why these developers could not continue projects when the real estate market later fell into sluggish development period. The situation at Saigon One Tower and Kenton Residences projects was typical examples of this. On finding a solution, Chau calls for the government to introduce policy incentives to help firms resume the project pace. “The government should step in to rescue firms, as, under current Law on Real Estate Business, ‘red book’ is essential to make project transfers eligible, meanwhile the developers of ‘death’ projects do not have these ‘red books’ because they have yet to complete land use fee payments,” Chau said.